Fried Catfish is Easy to Make! This recipe offers methods for creating a crispy and crunchy outer coating with a mild, flavorful and flaky inside! Delicious!! First, soak the catfish in buttermilk for about 30 minutes; season it with a pinch of salt, pepper, and cayenne pepper. Meanwhile, prepare your cornmeal with the same seasonings. Beat a few eggs and place them in a shallow pan; place the seasoned cornmeal in a shallow pan. Next, heat a heavy bottom skillet with oil. You’ll want to use an oil that can withstand high heat: vegetable, peanut or grapeseed. If you’re inclined, you can use Crisco shortening; the fish cooks up better with the lard, but it’s not very good for your arteries…. Once the skillet and oil are good and hot, throw in a few fillets. Do not move them. Let them cook until the underside is crispy golden brown…then flip the fillet. Wait another 5 minutes or so and move the cooked fillets to a plate covered with paper towels; allow the fillets to drain; cover with foil and make the next batch of fillets. You can squeeze fresh lemon juice over the cooked fillets, or leave them and garnish with a slice of lemon. Accompaniments include tartar sauce, baked beans and coleslaw! No need to pay overpriced restaurant prices for something that is so easy to make! It just takes a little planning and preparation. No mayo coleslaw is the perfect side dish for your next outdoor event! Keep it fresh and cool by placing its serving bowl in a vessel of ice! Sweet and tangy, it pairs well with barbecue, ribs, burgers, you name it! 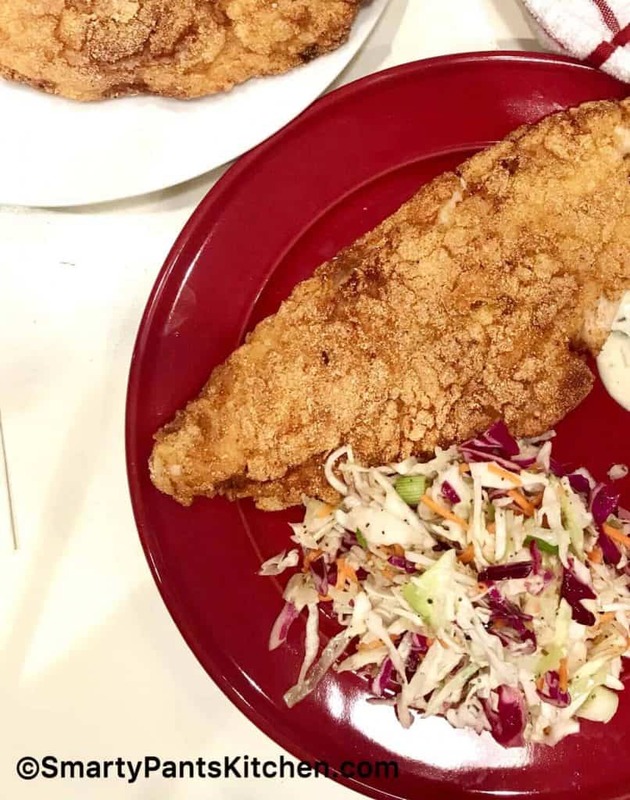 You might want to make No Mayo Coleslaw to go with your awesome catfish!